The spotlight of National TV was on the Texans Monday night, and a trio of Houston offensive stars delivered, as the Texans overcame an early 10-0 deficit to pound the AFC South rival Tennessee Titans 34-17. It took about eight minutes and being down 10-0 to get going, but the Texans got going, and when they did they raced through the Titans defense for 34 points. Deshaun Watson finished 19-of-24 for 210 yards, two touchdowns and zero interceptions while adding 70 yards and a score on the ground. Lamar Miller ran for 162 yards and a touchdown, and Demaryius Thomas caught his first two touchdowns in a Texans uniform. The Texans put the game away in the second quarter on a matter of two plays. First they got a defensive stand on the Titans on the Texans three-yard line, and on the next play Miller sprinted 97 yards to pay dirt, turning a 14-10 game into a 21-10 game. 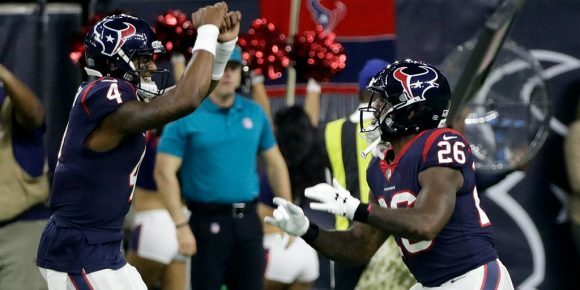 With the air out of the Titans balloons, the Texans continued to pour it on, as Ka’imi Fairbairn hit two field goals to push the lead to 27-10, and after Corey Davis caught a 48-yard touchdown pass from Marcus Mariota to make it 27-17, the Texans put the nail in the coffin with another scoring drive. This time they went 60 yards in seven plays, with Thomas catching his second score of the night, this time from 10 yards out to end the scoring. The win puts the team at 8-3, and they sit as the three-seed right now in the AFC. They play host to the Browns at home Sunday. LAMAR MILLER PUT ON THE BURNERS! ????? Subscribe to Texans Gab via RSS Feed or E-mail and receive daily news updates from us! 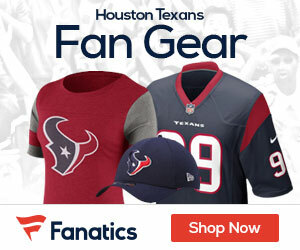 Sign up to receive our daily Texans Gab newsletter, and keep up to date with all the latest Houston Texans news. Celebrity Seats has the best Houston Texans Tickets, Houston Astros Tickets, and Houston Rockets Tickets!